Greetings! I’m Jun, a frontend engineer at LINE. We had a five-day event for internal engineers called the “LINE Haskell Boot Camp” starting on October 24th, 2016 at the LINE Shibuya office. I will share what the event was about, and what Haskell is in this post. Haskell is a modern application programming language that helps you write high-performance software with a great deal of flexibility, composability, and safety. With recent successful cases of adopting Haskell by companies like Facebook or Standard Chartered, this innovative tool has been gaining attention as it has inspired many libraries and concepts in other languages. LINE is not an exception in this regard. With growing interest in Haskell, there is an increasing number of developers having study group meetings on Haskell or developing internal services written in Haskell. The LINE Haskell Boot Camp was a five-day gathering of engineers attempting to enter the world of safer and happier programming. Instead of diving into the depths of Haskell’s theoretical background, we chose to have a hands-on experience to effectively spur further enthusiasm for Haskell. 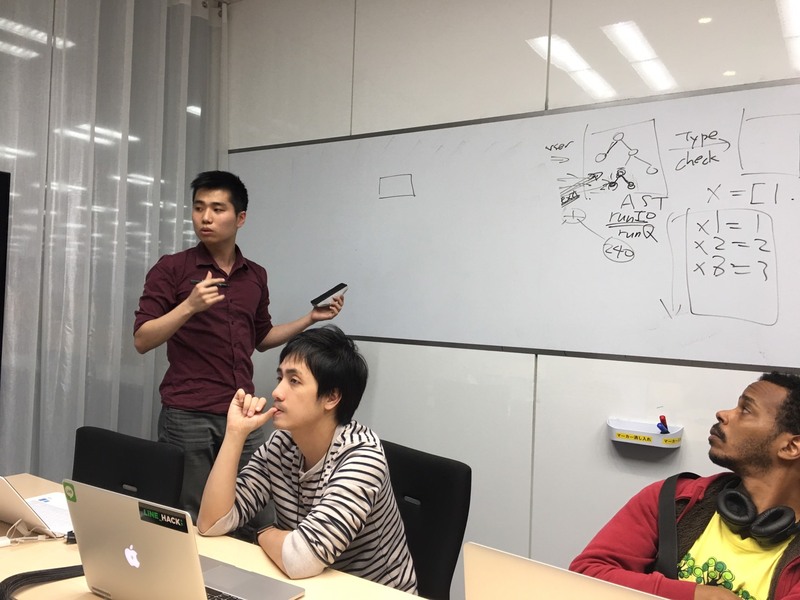 The event was organized by Han, a LINE Plus Corporation engineer who recently released an internal web service in Haskell. Here are some examples of making a high-performance program while keeping the code safe and simple at the same time with Haskell. In the definition of the appendIfNeeded function above, none of the types are stated. However, thanks to Haskell’s type inference, the parameters of the function, xs and ys, are guaranteed to be comparable lists. If the value is not a list or if the elements of the lists are incomparable, the compiler will raise an error. Haskell’s type inference keeps the code simple while reducing the risk of having wrong code executed at run time. The safety guaranteed by Haskell is not only limited to value types. Let’s say that there is a function type as shown below. The toString function shown above is an ordinary function that is applied to an integer and returns a string. This function can be implemented in any language. However, Haskell guarantees that if the function is applied to the same integer, the same exact string will be returned, regardless of where and when the function is executed. In other words, for Haskell functions, if the input value is the same, the output value is also always the same. In other languages, the result of a function call is uncertain without actually looking into the code. Calling a function could lead to the unintentional transmission of specific files from a file system to a server, or even to the firing of intercontinental ballistic missiles. However in Haskell, you can be sure that there won’t be any such unexpected incidents. On the other hand, the readFile above is a function that is applied to a certain file path and then reads its content. This function needs to access a file system, and the file system can change at anytime. In these cases, Haskell can make a function an action by using a type called IO. An action can interact with the real world and can make meaningful side effects like file I/O or network communication. Moreover, the important thing is that only the actions designated by the IO type can make these side effects. You don’t have to look into any other code other than the actions when an exception occurs for the side effect. This separation of the side effect not only makes the code structure healthy but also reduces the cost of maintenance. As mentioned above, Haskell is a language that guarantees referential transparency by managing side effects at the type level. The Haskell compiler, at compile time, can tell which type a function has as its parameters and return value, if a function returns the same value regardless of time and location, and if it can cause side effects. This naturally makes it easier to implement parallelism and concurrency. Parallelism and concurrency are the two most important, and also difficult, subjects of modern programming. In most languages, programmers solve these difficulties by paying more attention. However, as the Haskell compiler already has sufficient information, it can manage concurrency on its own. This expression expresses the summation of the results of applying a function f to x and a function g to y. As Haskell’s + is not an IO action, the compiler knows that neither f nor g is an action, even without a type notation. This means that f x and g y will return constant values regardless of where and when they are executed. To put it differently, even if f x and g y are executed simultaneously or executed on different CPU cores, the return values will always be the same. Therefore, by providing a simple hint about parallelism to the Haskell compiler, you can make a program which can run in parallel. In the code above, the par function makes f x and g y run in parallel, while the pseq function makes it so that the latter expression is evaluated after the previous part is done. Now, with proper compile and runtime options, f x and g y will run in parallel automatically. This means that you don’t have the hassle of dealing with processes, threads or thread pools to implement concurrency and parallelism. As the examples above have shown, Haskell has an effective and innovative structure which enables safety, referential transparency and concurrency with simple code. Furthermore, Haskell also has plenty of advantages including performance, composability, community and ecosystem. The five-day boot camp involved two-hour sessions every afternoon and was a demanding time commitment for busy people. Nevertheless, we had so many participants that the venue was overloaded and we had to bring in extra chairs and put them by the door. It was encouraging to see such a large number of fellow LINE engineers eager to experience a better technology. Each session began with Han’s presentation slides which went through basic concepts and conventions and was followed by a hands-on live coding session. Haskell has a concise syntax, but it may look totally alien for newcomers. Many beginners would give up and break off at this point but to prevent this from happening, the boot camp was focused on getting everyone familiar with actually coding in Haskell. An interesting thing was that the engineers came from a variety of backgrounds from client, server, to the front end. Haskell, under the de facto motto of “avoid success at all cost”, has pushed forward an avant garde advancement of the Haskell programming language and has resulted in a positive influence over many other languages. This means that learning Haskell will help in understanding and mastering other languages as well. I felt that the introduction of these concepts and their counterparts in other languages was beneficial for both understanding Haskell and understanding Haskell’s value in the world of programming. One thing I liked about the boot camp was that, while Haskell itself can be infinitely profound, the sessions tried to stay as practical as possible. People with prior knowledge of Haskell associate it with words like lambda calculus, category theory, type class, and monad, all of which sound very academic and terrifying. On the other hand, Han described Haskell in terms of its pragmatic advantages like flexibility, composability, and safety. Of course you don’t need a doctorate in category theory to use Haskell. Learning Haskell shouldn’t be too different from learning other languages; once you get to know how to code in it, you can try building stuff with it and proceed to more sophisticated notions. The LINE Haskell Boot Camp seemed to accomplish this purpose pretty well. The boot camp followed a curriculum slightly different from the traditional approach taken by most Haskell gatherings. The first day began with an overview of Stack, a development tool, and Stackage, the repository of Haskell packages and documentation. It then went on with the goal of building something useful and covered required tools such as Text and Bytestring which resolves the inefficiency of strings, Template Haskell which enables metaprogramming in Haskell, and WAI which is the web application interface of Haskell. Haskell meetups tend to be academic, so I found it impressive that this boot camp was filled with ready-to-use knowledge for developers from various fields. We weren’t completely immersed in code or libraries for the whole five days. One important purpose of the boot camp was to garner interest in and to encourage everyone to use Haskell in the long term. Han’s idea was to ask “Why Haskell at LINE?”. We came up with real-world answers to that question. At LINE, a large number of engineers work together on a service that operates on an even greater number of virtual or physical machines, which is then used by a far greater number of users. In this context, service reliability is vital. To achieve high levels of service reliability in mainstream languages, developers are forced to pay attention to following strict conventions or using outside devices such as static code analyzers or testing frameworks. On the other hand, Haskell guarantees safer programs at the language level, making it a viable option when reliability is paramount. Another gift of Haskell is that it appeals to programmers who are passionate about the act of programming itself. Using Haskell increases the chance of working with motivated developers who pursue excellence. If you are willing to recruit talented developers like LINE does, Haskell is surely worth a try. Haskell hobbyists may find it surprising that LINE uses Haskell at all or that it held an internal Haskell boot camp. So did I as a long-time personal follower of this language who never expected to be able to use it at the workplace. The LINE Haskell Boot Camp was a reminder for us that LINE, as a technology company, values the importance of engineering and its underlying backbone. It was also a personally delightful occasion that made me realize I actually work together with colleagues who are motivated and willing to learn. The greatest achievement of this boot camp, I think, is that it demonstrated that a future tool is now mature enough to be chosen even in a commercial context. Despite its academic origin, commercially successful deployment of Haskell is now a reality. The practical aspects of Haskell covered in the boot camp attracted my attention as well, especially when it comes to software transactional memory which looked promising enough to be something I would actually want to use in production. Although we couldn’t cover all of the details of these appealing aspects in the given time, the boot camp did its job in sparking my interest in Haskell, allowing me to have a better grasp of the tools, and encouraging me to venture into using Haskell as a real-world weapon. I hope my efforts in using Haskell will eventually bear fruit so that I will have some more positive news to share with you. For instance, I hope to, one day, deliver a technically detailed introduction of software written in Haskell that sits within LINE’s server architecture. 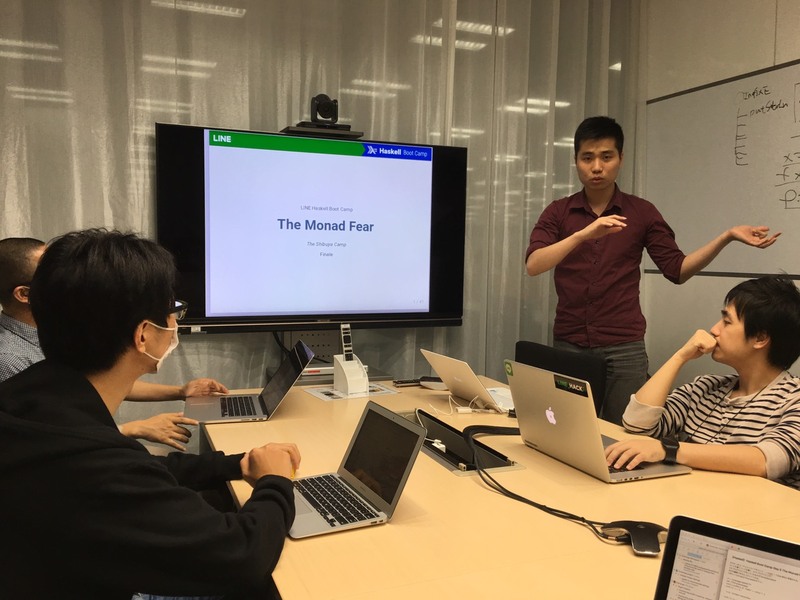 Below is the presentation slides of the final day, The Monad Fear. Please take a look.